Guide a group of legendary warriors on a journey through the tragic history that doomed a kingdom and drove a hero down a dark path 500 years before the events of the Xenoblade Chronicles 2 game. Defend yourself from Malos and his forces using all the fury of this refined battle system, allowing you to fight as both the artificial lifeforms known as Blades and their masters, the Drivers. 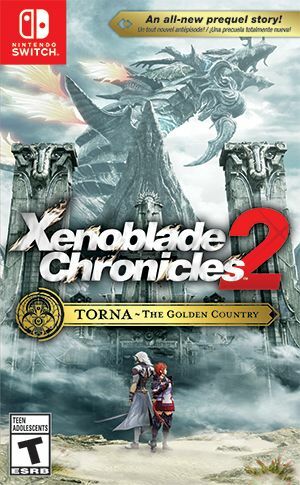 The story of Torna - The Golden Country covers not only the pasts of key characters from the main game like Jin, Mythra, Malos, and Praetor Amalthus, but will also spotlight characters like Lora and Addam, who factor heavily into the lore of Xenoblade Chronicles 2. The main story in Xenoblade Chronicles 2 is the story of Rex and Pyra (Mythra), but Torna - The Golden Country follows another set of main characters, Jin and Lora. Players will see what happened in Jin's past, what kind of person Lora was, and even what the relationship was between Addam and Mythra. The Tornan Titan will be added as a new field map in Torna - The Golden Country. A lot of other RPGs set their additional story sections on existing maps, but Torna - The Golden Country's maps will be entirely new. And in addition to the field map, the capital city of Torna will be added as a new town map. Given that these events take place 500 years ago, the playable areas in Torna - The Golden Country will be limited to Torna and the surrounding areas. Torna - The Golden Country is set in an era of history before Drivers and Blades had learned to co-operate seamlessly during battle, and so there will be a new battle system used in this expansion. The refined battle system will still be based on the one seen in the main game. New songs have also been added to Torna - The Golden Country. They were composed by Mitsuda-san and some others who were involved with the main game. Important! Xenoblade Chronicles 2: Torna ~ The Golden Country is an expansion that requires the full version of Xenoblade Chronicles 2.